Alzheimer’s patients often cover up so well that even adult children or siblings may see a totally different side when they visit or call. Yet, caring for a loved one with Alzheimer’s, can be an all-consuming 24-hour-a-day, seven-day-a-week challenge. Anna first began to notice when her husband, Peter, began to show some difficulty recalling words. This seemed especially disconcerting because Peter, a college history professor, had always been extremely articulate. Soon, he began repeating himself, asking the same questions over and over again. A prodigious reader, he would stare for hours at the same page in a book or newspaper. He became increasingly forgetful, sometimes not remembering why he had gone to the store or how to drive home on streets he had known for years. Anna knew this was not a case of normal aging. 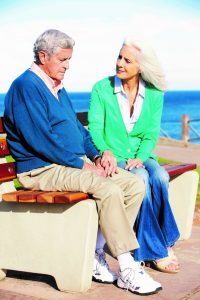 She took him to see a geriatrician, but she already knew the diagnosis — Alzheimer’s Disease. Peter was still in the early stages, she was told, but the illness would soon rob him of his mind and change their lives forever. It didn’t take long. In addition to losing his cognitive faculties, Peter’s personality and behavior began to change. He became more contentious and demanding. He required more and more attention, soon becoming as dependent as a young child. The responsibility fell 100% on Anna. Her children lived more than an hour away and, while she never complained, the stress of worrying about Peter — Would he leave the oven on? Would he walk out of the house? — was slowly killing her. Anna’s story is hardly an unusual one. As many as 5.3 million Americans are living with Alzheimer’s disease. Alzheimer’s destroys brain cells, causing memory loss and problems with thinking and behavior severe enough to affect work, lifelong hobbies or social life. Alzheimer’s gets worse over time, and is fatal. Today it is the seventh-leading cause of death in the United States. Alzheimer’s is a disease that does not discriminate. It affects people of all backgrounds, ethnicities, socio-economic status, and education. What many families fail to focus on, however, is not just the person with the disease, but the family member who serves as the caregiver. Many caregivers experience such symptoms as denial, anger, social withdrawal, anxiety, depression, sleeplessness and irritability. Caring for a spouse or parent with Alzheimer’s, often leads to burnout. Since Alzheimer’s is not a disease like cancer or diabetes that is necessarily visual, other members of the family may not know what the caregiver goes through. Even in the later stages of the disease, Alzheimer’s patients can often manage to cover up so well that even adult children or siblings may see a totally different side when they visit or call. Yet, caring for a loved one with dementia can be an all-consuming, 24-hour-a-day, seven-day-a-week grind. Alzheimer’s is an insidious disease that slowly destroys a person’s life. Yet, it will also destroy the life of the caregiver. As for Anna, it took awhile for her children to realize this. Having finally reached the conclusion that “we have already lost one parent, we don’t want to lose another,” her children convinced her to get help from a local home care agency. With a dedicated person taking some of the burden off her shoulders, Anna was able to take a much-needed break. She was able to leave the house to visit friends and family. She could go shopping or just take time to read a good book. In short, she could do things for herself. The loss would never go away, but she could have some semblance of a life again. Manage your stress level. High levels of stress can cause physical problems. Use various relaxation and other techniques to ease the stress and consult your physician. Take care of yourself. Don’t ignore yourself in the process of helping your loved one. Watch your diet, exercise and get plenty of rest. Take time out for shopping, entertainment and getting away. Become educated. Find a support group to join, or contact your local Alzheimer’s Association to learn more about how to cope. Be realistic. Many of the behaviors that occur with the disease are beyond your control and the control of your loved one. Yes, you can grieve, but you must also focus on the positive moments. Do legal and financial planning. Consult an attorney and other specialists to discuss legal, financial and medical issues. Decisions need to be made sooner rather than later. Give yourself a break. You can’t ignore this. It may mean exploring home care, adult day care options or respite services. You need help. Don’t be a martyr. If at all possible, don’t do it alone. You can’t live like this for too long. Seek the support of family, friends and community resources.